If your anything like hopeless romantic Don, then a menu featuring lamb is the ultimate secret weapon in securing romance. After all, nothing brings people together like delicious home-cooked lamb. Check out the Meat & Livestock Australia's latest Lamb is for Lovers episode featuring Don & his latest date Katrina. It's pretty funny. Pete and I have been busy lately cooking up a selection of delicious lamb dishes which include sausages, cutlets, chops, roast, rack of lamb and koftas. Here is a selection of some of the dishes we have been enjoying. 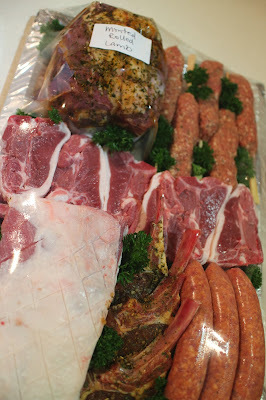 The Food Mentalist & Meat & Livestock Australia are giving one lucky reader the chance to win a delicious meat tray packed full of lamb meat products - similar to the one pictured above. TO WIN, simply tell us what your ideal lamb dish is for a first date. Leave your answer along with your name and a valid email address so we can contact you if you are the lucky winner. The Competition is open to readers across Australia and closes Friday 13 December at midnight. The winner will be announced on Saturday 14 December on Facebook, Twitter and here on The Food Mentalist. There's a spiced lamb meatballs with balsamic/fig/rosemary compote recipe that is the bomb (from the book Practical Paleo), perfect for a first date. Of course you can never go wrong with a slow cooked rosemary/garlic lamb shoulder and duck fat potatoes with a hint of lemon. Lamb cutlets with rosemary and garlic, french trimmed of course, with duck fat potatoes and a glass of pinot noir. Perfect! My idea of perfect lamb for a first date would be a Moroccan spiced lamb pizza – nice and casual, no pretence or finery. I’ve never cooked for a guy on a first date – if the relationship is going anywhere, I’d want a second date because he liked ME, not my cooking! NIGELLA knows about romantic food... I'd go for her NOISETTES OF LAMB with Blackberry Jus and roasted baby vegetables. Simple but impressive, tender and tasty with that interesting variation in the sauce. Roast Leg of Lamb with pumpkin, potatoes, fresh green beans and homemade gravy... because nothing says more to a woman that "I learnt how to cook from my mother" than a gravy made just from roux and meat juices.